View More In Shelves & Racks - Page 8. Organize your home or office with Seville Classics' 5-Tier Steel Wire Shelving Systems. This system is constructed from industrial-strength steel and features UltraZinc plating, which provides the same corrosion resistance and a similar shine to chrome plating. Shelves hold up to 300 lbs. each in units on leveling feet. These shelves are perfect for adding extra storage around the house, tidying garages, and organizing office spaces. Assemble with the included casters for a mobile storage solution. Total system capacity on leveling feet: 1500 lbs. Total system capacity on casters: 130 lbs. 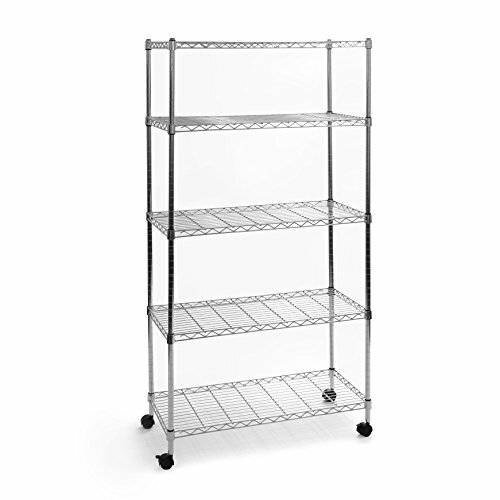 30" x 14" Shelves - Steel construction for heavy-duty multipurpose storage. 1500 lbs. Capacity - Each shelf holds up to 300 lbs. in systems assembled leveling feet. 1. 5" Wheels + Leveling Feet - Includes smooth-rolling caster wheels (2 locking) for easy positioning in your kitchen, garage, warehouse, or storage area. Plated Steel - Provides necessary corossion resistance in dry and heated storage environments. Easy to wipe down clean. Customizable - Shelves are height adjustable by 1-inch increments; no tools required.